Opposition Party Wins Big In Venezuela, Ousting Maduro's Socialists : The Two-Way Venezuelans voted amid an economic crisis that's led to soaring inflation and scarcity. Winning 99 seats, the opposition will now control the country's congress. 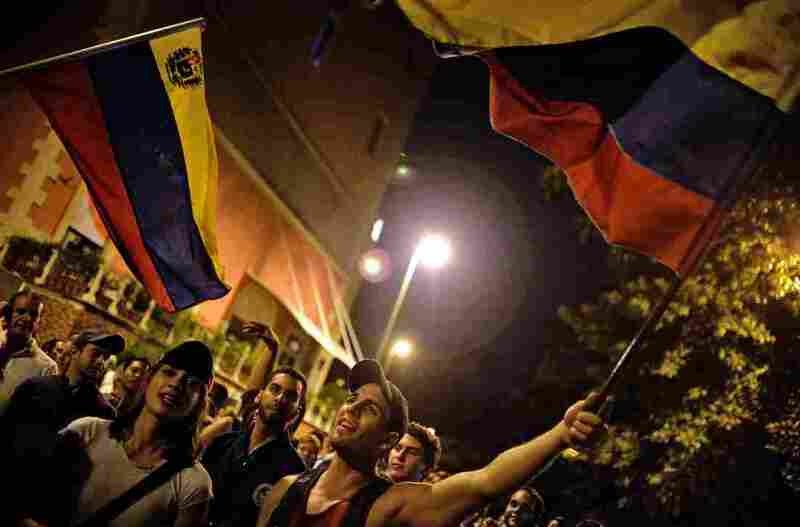 Venezuelan opposition supporters celebrate the results of the legislative election in Caracas early Monday. Dealing a big blow to President Nicolas Maduro's Socialist leadership, Venezuelan voters handed a majority of congressional seats to a coalition of opposition parties. "The opposition coalition won a majority of 99 out of 167 seats, and they could get more. As the results were announced people took to the streets in celebration in the capital launching fireworks and honking their horns. The socialists even lost in late president Hugo Chavez's home state of Barinas, where his brother Adan is governor. In the capital, the opposition won by almost 20 percentage points. "Venezuelans have been facing one of the highest inflation rates in the world along with scarcity of basic goods. Many are predicting that far from unifying the deeply polarized country, this will only deepen the divides. President Nicolas Maduro accepted the defeat, however, he said, 'A counter-revolution has triumphed, which has imposed its own way, its war.' The leader of the opposition Henrique Capriles tweeted 'Venezuela has won.' "
With three huge portraits of Simón Bolívar behind him, Maduro said that democracy had triumphed with this vote. But the leader also remained committed to the revolutionary ideals of his predecessor. "We've lost a battle, but the fight to build socialism and a new society is just beginning," Maduro said, according to the Venezuela's El Universal. The broader view of all of this is that this election marks a continued shift toward the right in Latin America. Just last month, Argentina voted in Mauricio Macri, an opposition figure who defeated the hand-chosen successor of current President Cristina Fernández de Kirchner.